Vous êtes à Prague et vous voulez avoir une expérience exceptionnelle, mais il y a trop de choix? Que faire et voir? Vous ne voulez pas vous ennuyer et vous fatiguer, vous manquez de temps ou voulez quelque chose extraordinaire? Découvrez Prague en Segway avec un guide personnel et local! Il suffit de réserver des heures de votre tour maintenant. Vous pouvez choisir exactement l'itinéraire de visite en utilisant les conseils de votre guide personnel avant de commencer dans notre bureau. Un dépôt de garantie ou une carte de crédit ne sont pas nécessaires. 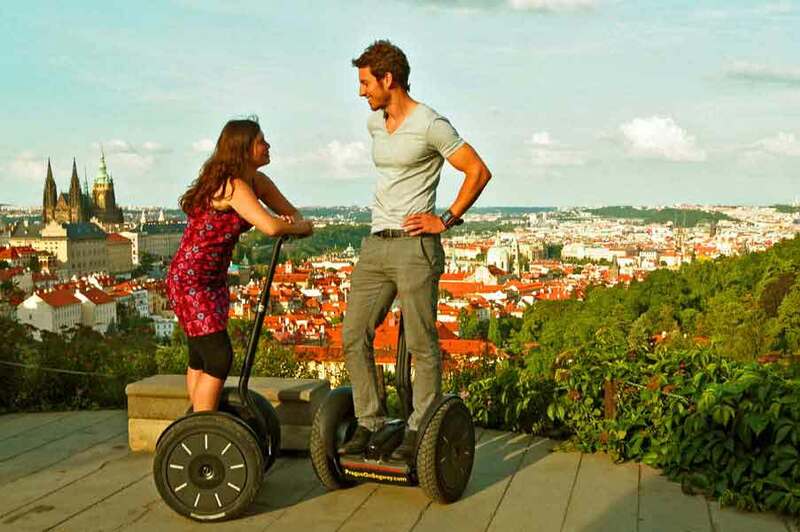 Riding on a segway is not allowed in the Prague districts Old Town (Stare Mesto) and Lesser Town (Mala Strana). 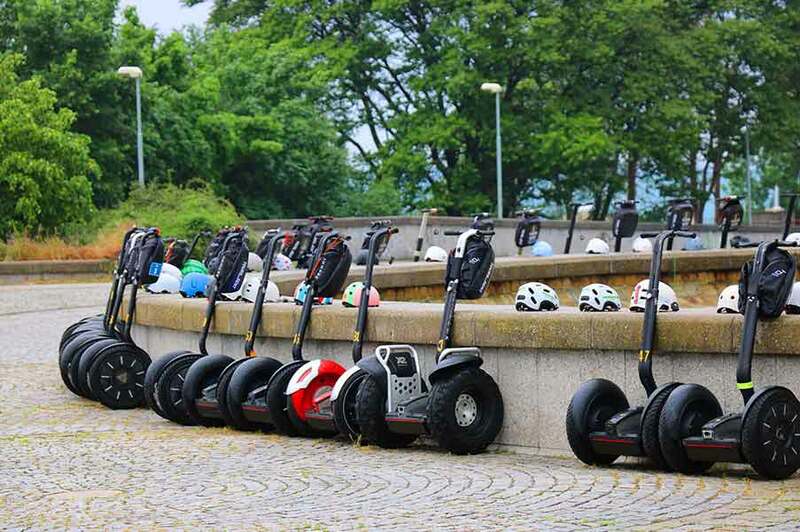 Our segway tours going in the Prague Castle area and in the Administrative Center. Explore Prague’s royal district, including Prague Castle, Embassy area, University district, Prague’s Beverly Hills and many more. You will be amaze by beauty of the biggest ancient castle in Europe - Prague Castle, unique panoramic viewpoints with 1001 towers, taste delicious beer in Strahov Monastery which is brewing more than 6 centuries with monks` secret recipe and another Prague’s wonders and landmarks. Our mini-bus shuttle will bring you to the start point form our office located in only 100 meters from the Old Town Square and after the tour returns you back. 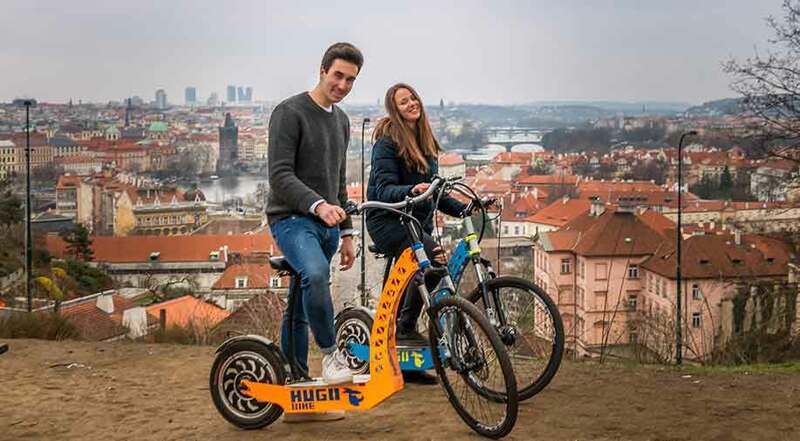 If you prefer discover only the Old Town and Mala Strana, where our former great segway tours were in the Heart of Prague - now it is available on E-Scooters Hugo! 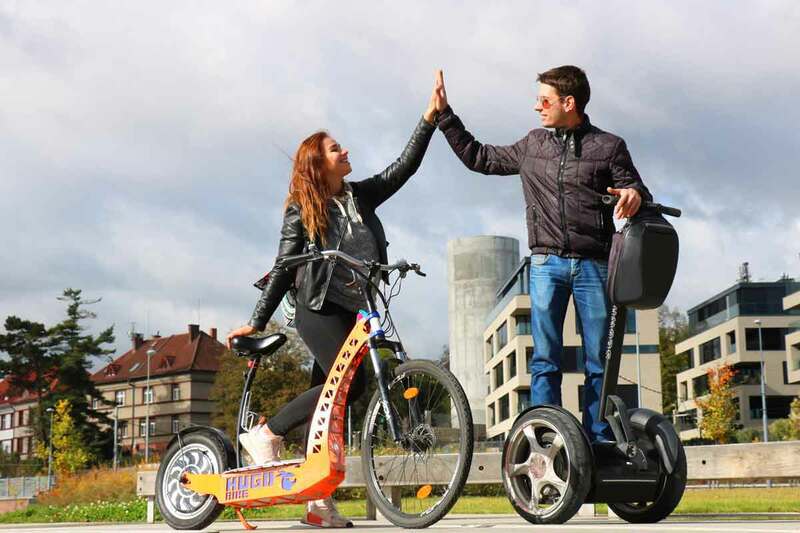 New options are also Combined Segway + E-Scooter tours, during it your Private Guide will show you both sides of Prague. With Prague On Segway we felt very much on our own, not part of the "thundering herd" of basic tourists in one of those "canned experience" tours. My wife, Nancy, & I took a vacation trip from NY State to Prague to celebrate our 30th wedding anniversary. It was our first trip to Prague. 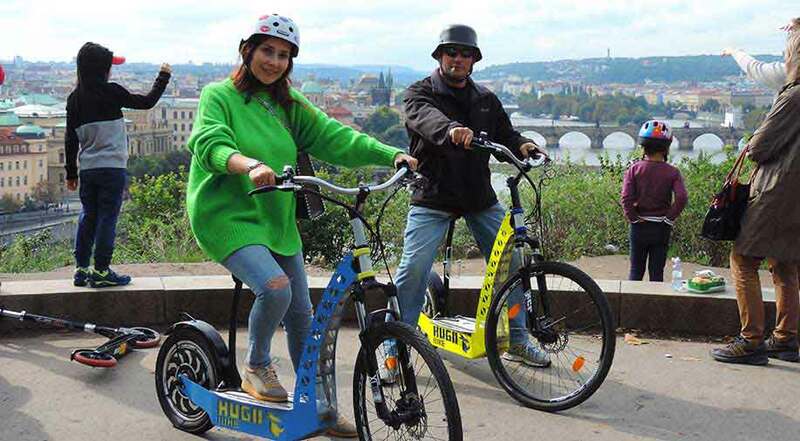 My brother and niece had vacationed in Prague and recommended the Prague on Segway tour. We contacted them via email from the USA, and were pleasantly surprised by the prompt and understanding response. Visiting Prague, we were having a little fun getting our tongues around some of the street names, and were a bit overwhelmed by all that Prague has to offer. We arrived at Prague on Segway's site at our scheduled time, and were met by Kate, our guide. Kate was incredible. She was warm, calm, well spoken in English, learned as to the history and culture of Prague and contemporary history. Kate asked us what we'd like to see, and we worked out a tour route in a matter of a very few minutes. Since Prague has so many sights and covers so much land area, Kate worked out a route that would take us over a lot of the high ground overlooking the city, as well as the Palace, and some interesting squares and architectural gems such as cathedrals. Kate got us situated on our Segways. It was a first for Nancy and me, being on Segways. I am used to running machinery and riding heavy motorcycles, so the Segway quickly became second nature. Kate worked with Nancy to reassure her and in a very few minutes, Nancy was checked out and competent on her Segway as well. Kate took the point, and I took the back door, putting Nancy in "the rocking chair" position. Off we went, with Kate carefully checking our progress at mastering the Segways. Kate was ever vigilant, and anticipated changes in the riding conditions such as ascending or descending grades, curbs, and traffic. She piloted us through traffic and all sorts of varying road and sidewalk surfaces. The only way to describe this is based on many years of riding thousands of miles on motorcycles with one or two trusted buddies. You just know when the person on the point is looking out for you and is able to anticipate your moves and ride accordingly. This was Kate. She was fluid and natural, and we lost any stiffness we may have had initially on the Segways. As Kate put it: "A Segway will become like an extension of your nervous system". We toured Prague and packed a LOT of amazing sights into our tour. We used our tour as a kind of "introduction" or "overview" of Prague so that we could come back on our own to sights that we had seen on the Segway tour. Kate took us up some steep grades to the Straihof Monastery and to the Royal Palace, and all the while she would stop and give a bit of a dissertation about the history, architecture and some contemporary history. Kate took us to a nice park which overlooked the City of Prague. There was a beer garden, and we stopped for a drink. It was a nice break, and we were able to catch our breath and process a lot of what we had been seeing. Kate discussed the various places with us, and offered suggestions for places we could visit on our own. All too soon, our Segway tour was over. It was hard to believe we had spent three hours on the Segways. The Segway Tour did enable us to then continue exploring Prague using trams or on foot with a lot more confidence and familiarity. We asked Kate for recommendations on places to eat in Prague. Kate recommended a restaurant/beer hall chain called "Lokal". It was the BEST. We had eaten at a pricier restaurant the previous day, but Lokal surpassed it. Lokal is a new restaurant chain with several Prague locations, and features what is known as "Slow Food". It is food made from local produce and meats from local hogs and beefers, meats and wursts being made by Lokal's own butchers. The food in Lokal was incredible. The menu varies daily with what they buy in the farmer's markets and what the chef chooses to prepare. We were the only Americans in the Lokal restaurants, and we kept coming back for more meals. Kate made our trip to Prague memorable, and made Prague seem more welcoming than we ever imagined. Seeing Prague with a local person in a small group (just Nancy, myself and Kate) made for a perfect tour. We did not want to do the usual "tourist thing", and join some large group following a guide giving a canned spiel. We saw endless tour groups with guides holding up flags to lead what looked like 20 or more people, taking them where the guide/tour organizers wanted to go. We call this a "canned experience", where you are at the mercy of the tour operator and wind up eating in some mediocre restaurant, seeing "local people" come out to do some folk dance and going to shops that probably kick back some money to the tour operators. With the Segway Tour we felt very much on our own, not part of the "thundering herd" of basic tourists. We got a personalized tour and we saw and learned infinitely more than had we either tried to tour on our own from guide books, or joined one of those "canned experience" tours. I recommend the Segway tour and recommend that, if possible, anyone taking this tour ask for Kate. She is the BEST. I toured many cities in Europe and never been on a Segway Tour where we saw so much, had so many questions answered and truly had a life-altering experience! Prague on Segway is the only way to experience Prague! My brother and I were able to see the whole city in 3 hours (It would have taken us 15 hours walking to do what we did!). Our guide Tomas literally knew EVERYTHING about Prague. His exclusive attention to detail was incredible! The actual segways were up-to-date and were in great shape. Overall, this was the best experience of our trip to Europe. 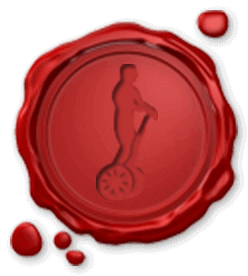 I have been to many countries and visited many cities in Europe and I have never been on a Segway Tour where we saw so much, had so many questions answered and truly had a life-altering experience!! This is the most exclusive Segway operator in Prague and the only company to do it with. 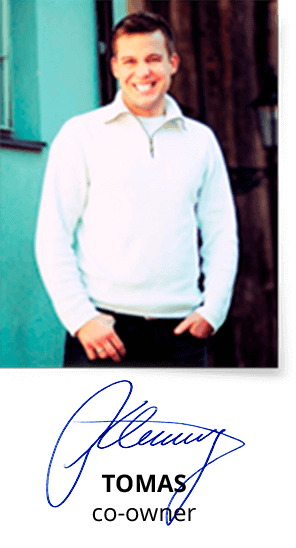 Why go on a tour with 10 people where no questions get answered and you are waiting around for other people when you can have a private, exclusive tour with the most knowlegable guides in all of the city? We have Tomas and Prague on Segway to thank for this wonderful experience! The quick (but thorough) safety and training session before the tour was perfect to get us on our way with confidence. It really is easy - young and old! I always do something unique when I travel and this tour - Prague on Segway was perfect!! My sister and I took the City Tour on Thursday. Michal did a great job of showing us the city highlights, and taking us to areas that would have taken us days to walk to. It was so much fun we booked a custom tour for Saturday to Vysehrad. Tomas was our guide and we had so much fun -- we were sorry that we weren't staying long enough to take a third tour! Between these 2 tours, we saw Prague from every angle. Both Michal and Tomas were professional, personable and made this experience the highlight of our trip. 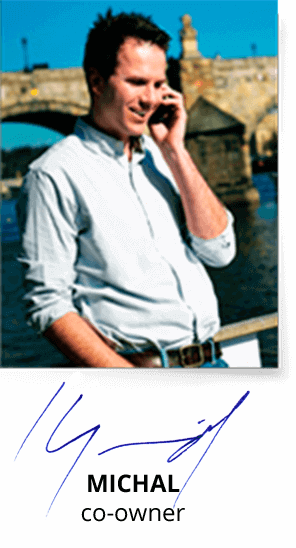 They have a great sense of pride for their city, and were very knowledgeable. On a personal note: One of the deciding factors to trying the Segway, was difficulty I was having walking the hills and cobblestone streets- my ankles hurt every night. But I didn't want to see Prague by car or bus... I wanted something more personal. This tour really let us get around and connect with the people of Prague. Before this trip, neither my sister nor I had been on a Seqway. The quick (but thorough) safety and training session before the tour was perfect to get us on our way with confidence. It really is easy -- young and old!. It was just AMAZING! We visited places that for sure we would not have on any regular tour, it is completely customized, it was just the 2 of us and the guide. My friend and I did the 3 hour Prague on Segway Tour, our tour guide was Caroline. This tour was the most fun and different tour I have ever done. We both thoroughly enjoyed it. It was February (so pretty cold) but we had so much fun we didn't care. Our guide Caroline was excellent, she was incredibly informative, very friendly and had a great sense of humour. We felt like friends at the end. Caroline was happy to adjust the tour so that we didn't go to places we had already seen or been to (as we did this tour on our 3rd day in Prague). I would actually recommend doing it when you first arrive because it gives you a great overview of what there is to do in Prague and you can get an idea of what places you would like to spend more time at. The Segways were actually really easy to use and we were confident going up and downhills within minutes. I wish I had one to drive around at home. Do yourself a favour and do this tour, you will not be sorry. I believe it is suitable to people of all ages. I haven't stopped telling people about this tour since I got home. Thanks Caroline and Prague On Segway for helping to make our Prague holiday very special and lots of fun. 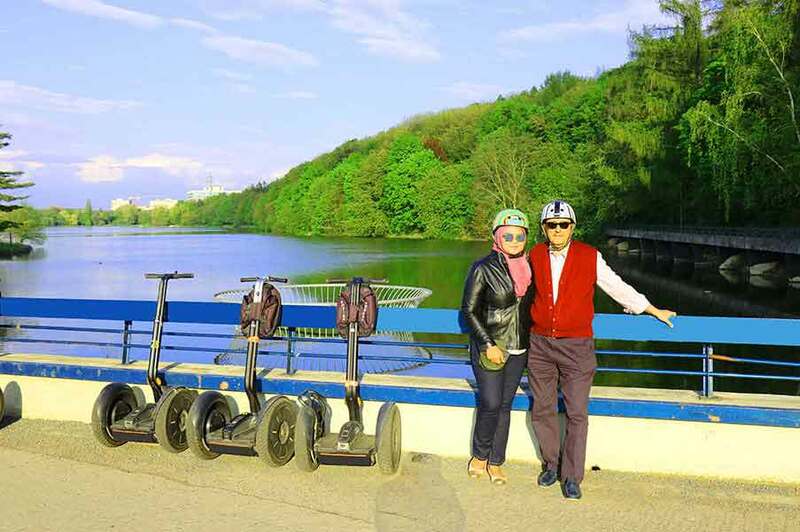 „I got segway tours by Prague on Segway as part of a gift. As an architect - and a local - I thought: This is going to be boring. But my girlfriend Lucka persuaded me to go. And boy was it enjoyable. The guide was not only funny, but knew more about Prague than I did. Plus my girlfriend found him quite handsome :). We took a five minute course in how to drive the Segway and then went to a round tour of Prague by night. Avec notre preparation c’est presque impossible. Tout le monde reçoit un bon entraînement: avant le tour vous pouvez pratiquer à conduire le Segway et on va commençer la tournée quand vous vous sentez confident et à l'aise. De plus, nous fournissons des casques, pour la sécurité supplémentaire. Une seule restriction est le poids. Pour que le Segway fonctionne correctement, vous devez avoir entre 35 et 125 kg. Considérez que si vous voulez faire une randonnée vous paierez la moitié de ce que nous facturons mais ils vous transformeront en moutons, vous regrouperont et vous feront suivre un parapluie. Ou une fleur. Nous, d'autre part, offrons un guide personnel juste pour vous (deux), et une expérience incroyable, que vous pouvez toujours retenir. 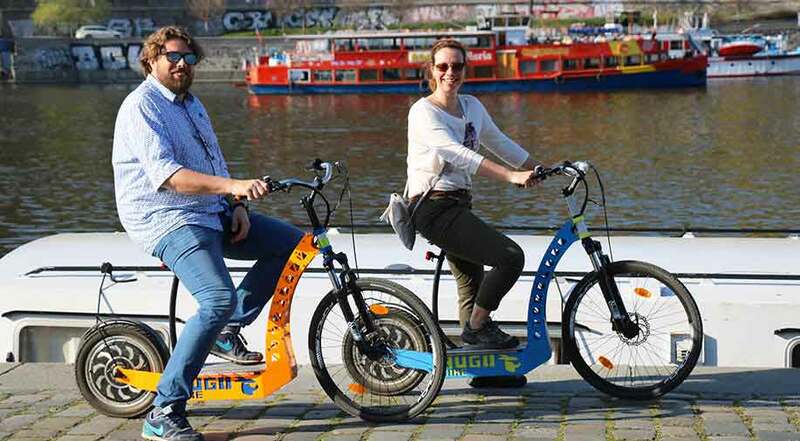 Nous sommes confiants que vous aimerez le tour, et nous vous garantissons que vous ne serez pas en mesure d'effacer le sourire de votre visage à la fin du tour de Prague en segway. Si nous voyons un visage malheureux, nous vous rembourserons. Ne nous croyez pas sur parole, lisez ce que nos clients ont à dire. 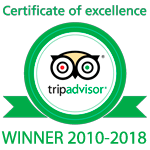 Consultez TripAdvisor et demandez à l'un des commentateurs de leur expérience avec segway à Prague. Quel tour de segway de Prague devrais-je réserver?